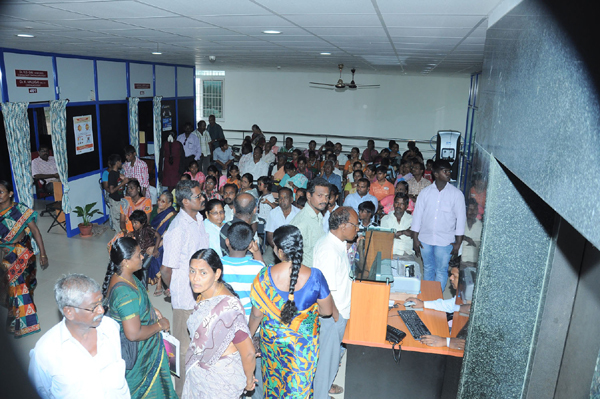 › As a part of our Social Services, in our Medical Centre, we have started OPTICARE DIVISION. 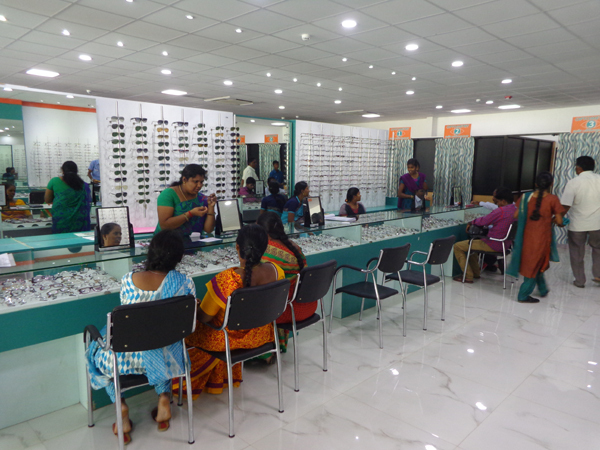 › Functions to provide affordable and high-quality spectacles to the marginalized Sections of the society. 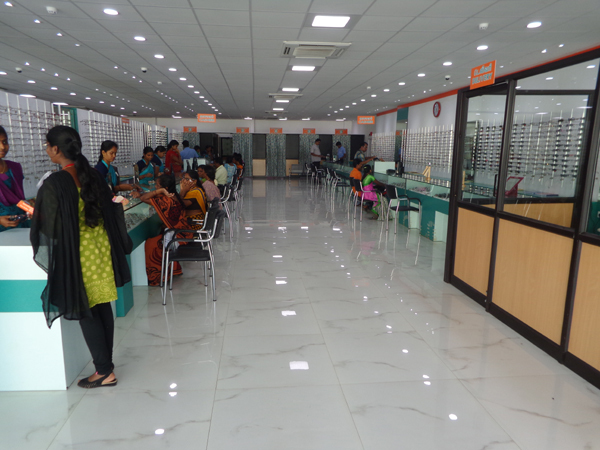 Qualified eye Doctors (Ophthalmologists) and Optometrists with the latest eye checking equipments like Auto Refractometer/Keratometer,Slit Lamp,OCT,NCT,etc.... are available. 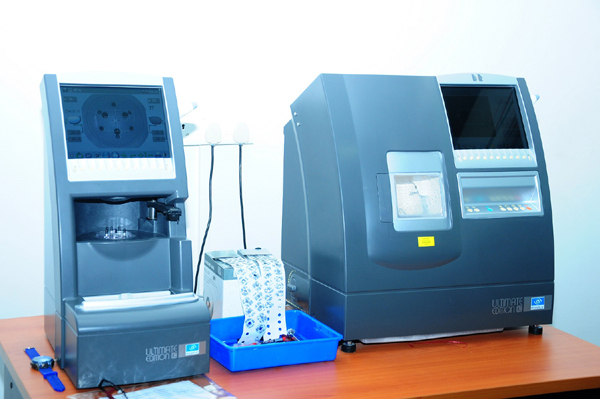 Computerized eye check-up includes measurements of the spherical refractive power, cylindrical refractive power and direction of astigmatic axis, as well as the radius of curvature of the corneal surface, direction of the corneal astigmatic axis are done using latest equipment like Auto Refractometer /Keratometer AR with KR 800, RM 800, etc with high accuracy & perfect measurements within a minute using digital technology. 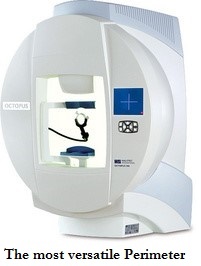 Haag-Streit Octopus 900 is used for testing and diagnosing glaucoma and neurological field defects. 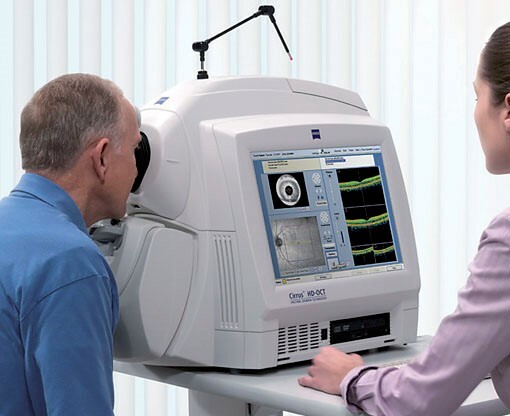 Scanning your eyes in 3D and analyzing your retinal structure, analyzing the macula, optic nerve head, and anterior segment pathology are seen in detail using the Zeiss Cirrus HD-OCT 3D retinal imaging. 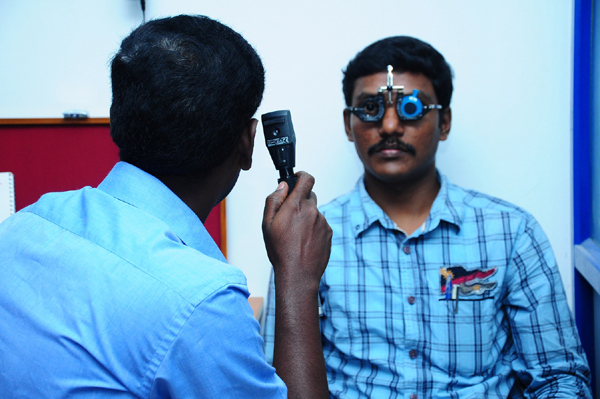 This instrument can visualize your eyes in 3D and show the simple clear pictures, can help to detect, monitor for follow up of any condition and visual disability. 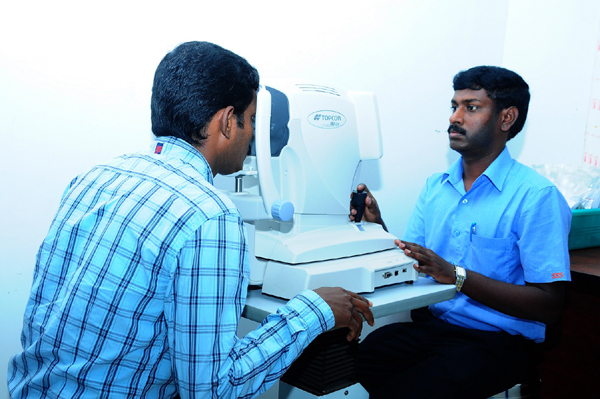 Traditional tonometer makes contact to eye, but Topcon NCT (Non-Contact Tonometer) emits gentle puff of air into the eye which measures the time taken for the air to flatten the small area of the cornea and return to instrument. 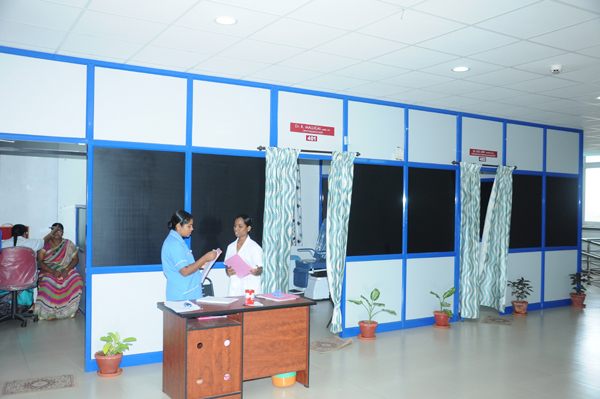 Can be done by any technicians and does not touch the eye so there is no contamination. 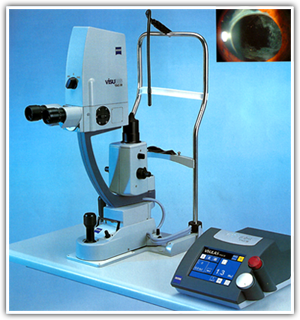 Zeiss YAG III laser is used for treating angle closure glaucoma’s and PCO (Posterior Capsular Opacification). It is used in angle closure glaucoma by creating an opening in the Iris- Peripheral Iridotomy (P.I).PCO- which in formed in the posterior capsule after IOL implantation after cataract surgery. 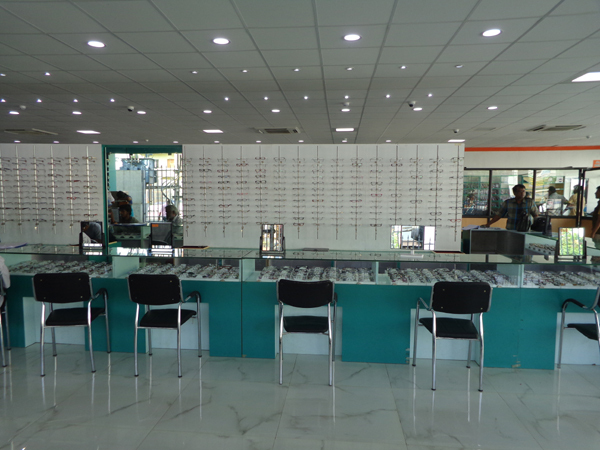 A large optical retail showroom (5000 Sq.ft fully Air Conditioned) to service the customers with different types of frames in various price ranges. 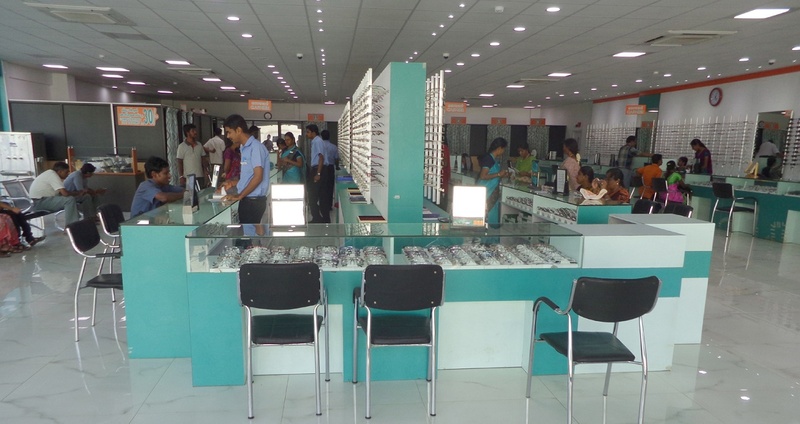 All types of Optical Lens & Frames, sunglass & Contact Lens are all available at ECONOMICAL PRICES. 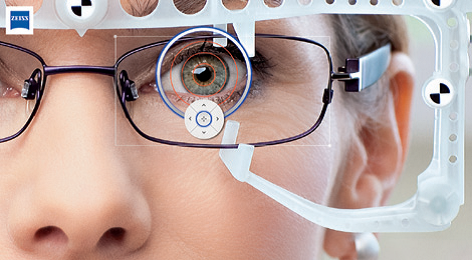 › One stop solution for all type of lens design Single Vision, Bifocals and Progressives. 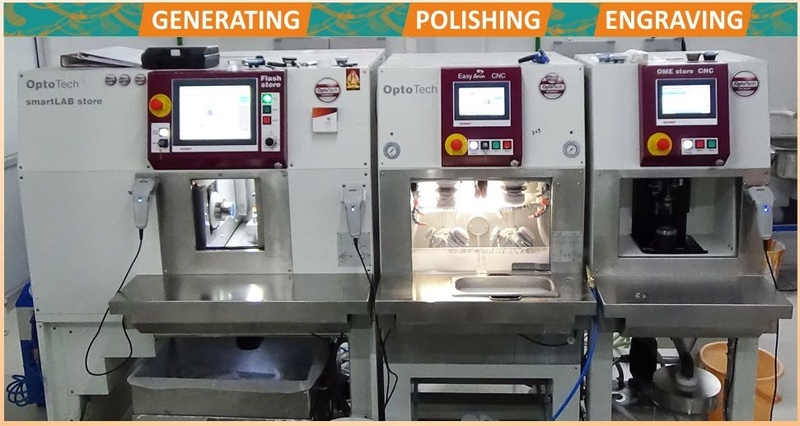 For Manufacturing Ophthalmic Lenses based on Prescriptions, an imported, Digital Freeform Lens Manufacturing Unit (7000 sq.ft) with the latest equipment from Germany at a Cost of Rs.7 crore to manufacture different types of lenses include single vision, bifocal, progressive-photo chromatic and polaroid lenses is available. 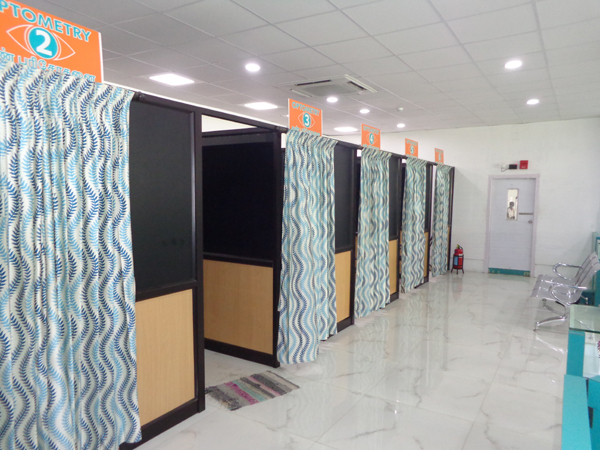 Supporting this are full-fledged Checking & fitting equipment imported from Belgium at a cost of ₹ 1.5 crore rupees. Green Production concept - All processing machines use a revolutionary clamping technology that has no negative impact on the environment. 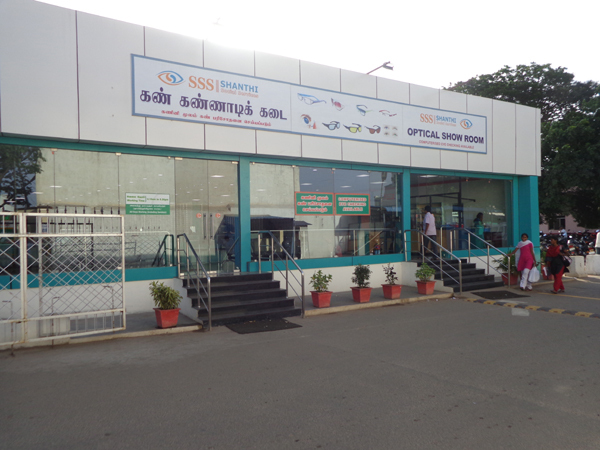 High-tech quality inspection machines like SG-2, SPV-2, SPF-2 & Spectrophotometer are available for checking the lens quality for ensuring the best quality product is supplied to the customer. 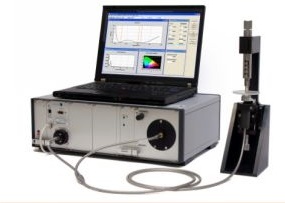 SPF-2: - The Focovision by Transmission SPF-2 is used in optical laboratories to measure the lens optical power where the lenses are mounted into frames. 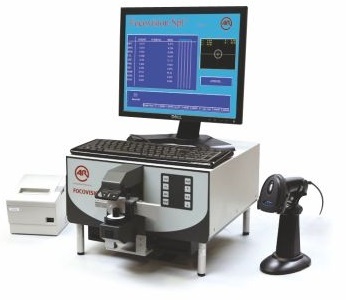 Spectrophotometer: - The OptoTech Spectrophotometer ETA-ARC AT is a fast, precise and easy-to-use non-destructive measuring system for thin film coatings on curved substrates, e.g. 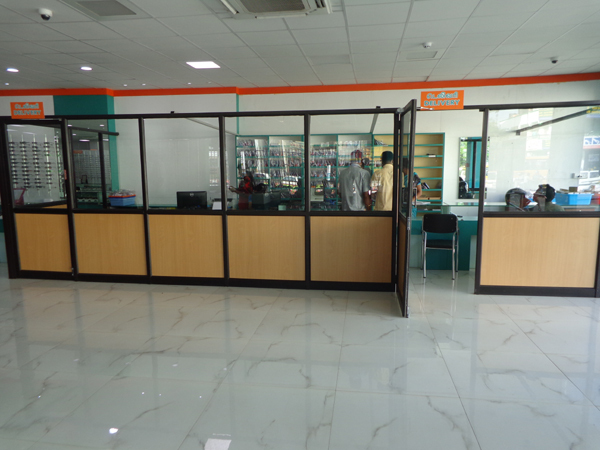 for anti-reflection coatings, hard coatings, and interference filters. 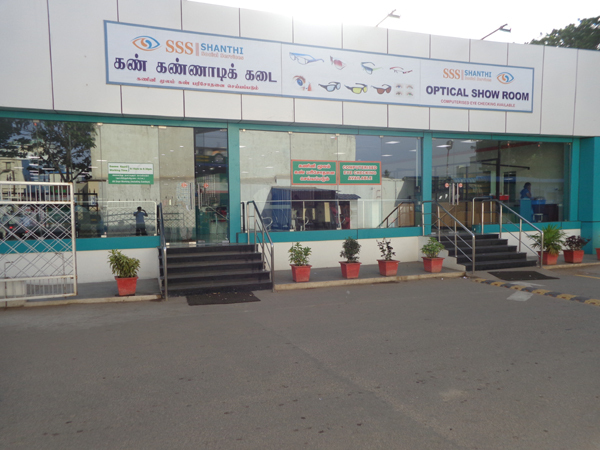 High-performance, latest & sophisticated Edging machines like NEKSIA, KAPPA CTD, etc., are available for quality fitting of lens in frames. FAST, EASY AND EXTENDED FRAME TRACING: Helps you trace any type of frame effortlessly, including children frames, small B-size and large A-size frames. AUTOMATIC DRILLING-HOLE RECOGNITION: Achieves even greater productivity due to automatic detection of drilling holes and flat bevel shapes. CONVENIENT CENTERING AND BLOCKING: Make centering and blocking straightforward and precise. 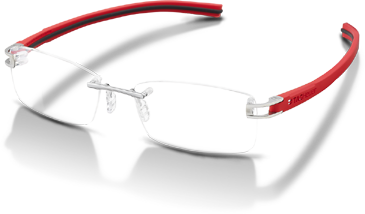 CONSISTENTLY INTELLIGENT CHAMFERING: With the flexible chamfering wheel, the pressure applied to the wheel adapts seamlessly to the lens edge depending on the shape and curve of the lens. IMPROVED AXIS ACCURACY: By combining new edging-cycle algorithms and cutting-force regulation, optimal results are guaranteed whatever the edging situation. 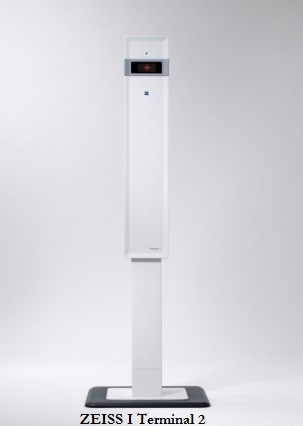 BEST AUTOMATIC CYCLES: For 90% of the jobs, all it takes are a few clicks to achieve a perfectly calculated bevel, groove or drilling cycle. 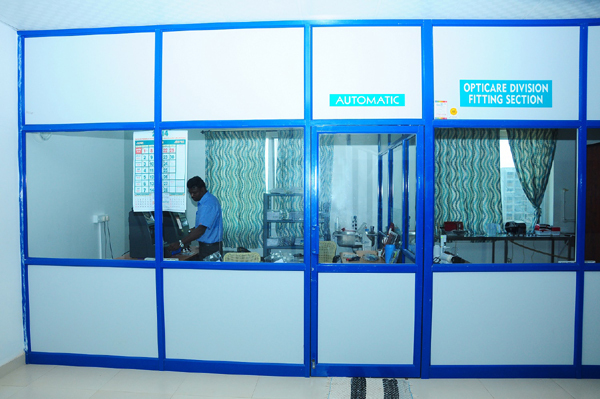 › Rinse the Lenses under warm running water. Wash the entire frame, including the nose pads. › Don't use too much water pressure or you may ruin your glasses. › Do not use citric-based detergent or dish soap. This can damage the glasses. 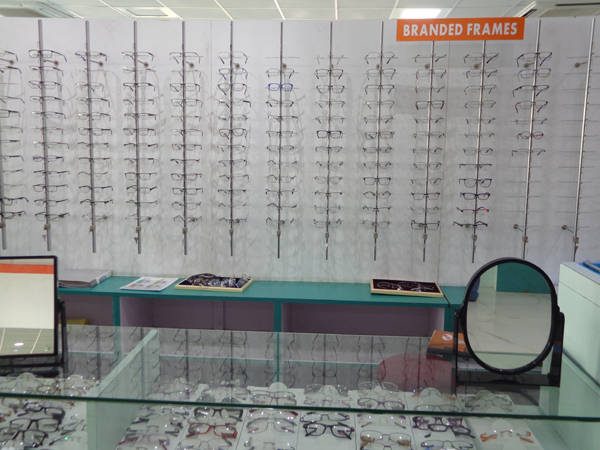 › Try to avoid using rough material to dry your glasses because this could cause scratches. 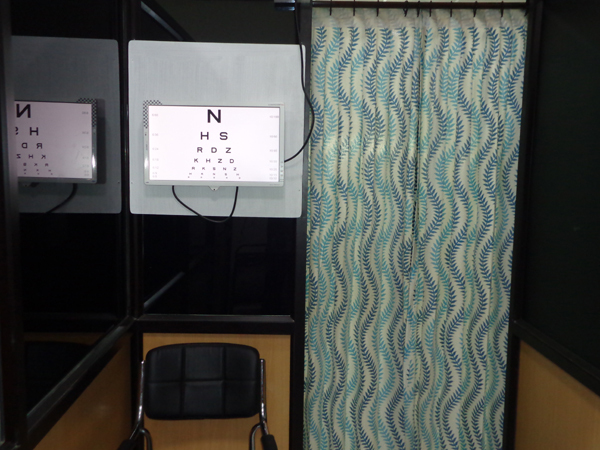 › Use a good quality cloth designed for lens cleaning. It is good to dry glasses with microfiber cloth. › Always remember to clean your glasses at night before bed. 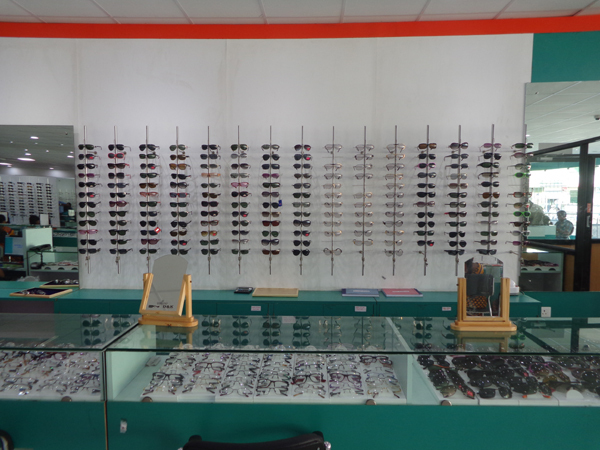 › Buy a case for your glasses to keep them clean, and ready for use. › Use caution and use both hands to take your glasses off and put them on. › Clean your eyes with pure cold water regularly. 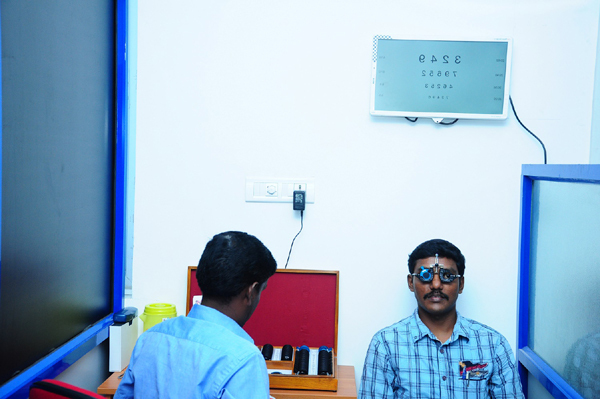 This is one of the best ways to keep the eyes healthy & disease free. 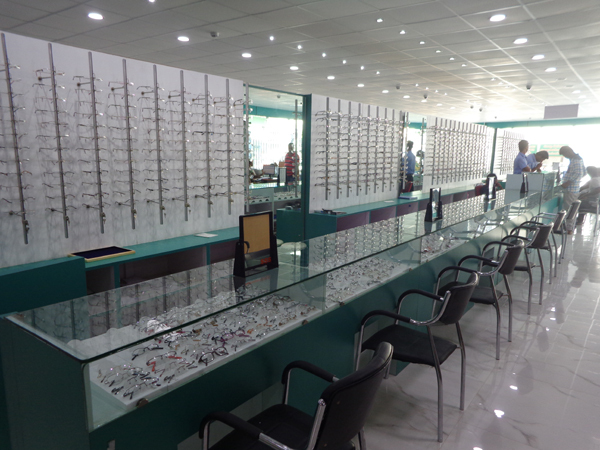 › Avoid looking at the sun directly, artificial lights or shining objects. Direct rays of bright light can damage the retina. Avoid excessive UV exposure. › Rolls your eyes up & down, then side to side& move your eyes in a circular motion. Repeat this exercise 5 to 10 times a day to relax your eyes. › Maintain a good distance from the computer screen – sit approx. 22-28 inches away from it. Sitting too close or too far may increase strain on your eyes. › Change all hand-held games to outdoor games. › Eat a Healthy & balanced diet..